A task force created by Lake Oswego School District Superintendent Michael Musick is scheduled to meet Dec. 17 as officials continue to move forward with the process of planning for a new district pool. 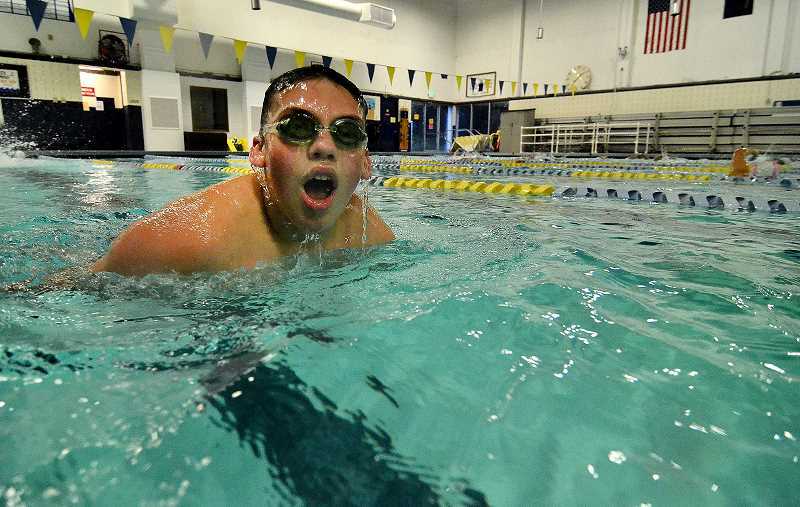 A $187 million bond measure approved by voters in May 2017 included $7 million for updating or replacing the current dilapidated pool, which is in such bad shape that officials have since decided it can't be repaired. The new pool will be located on the campus of Lakeridge Junior High, with construction likely to begin in the summer of 2021. What the pool will look like and what it will cost are still to be determined, officials say, but it will definitely be part of a master plan for the site that is now being prepared by Mahlum Architects — the same firm responsible for the design of LJH. "I should say, though, that the first thing people need to know is that the district is firmly committed to building a great aquatic center for the city," said Lou Bailey, the district's executive director of secondary programming, who is co-facilitating the Pool Task Force — along with Community School Director Morgan Rauch — that Musick created in October. The task force, made up of LOSD administrators, teachers, student swimmers and community members, has only held one meeting so far. But the Dec. 17 meeting will be led by Ken Ballard from the recreation and aquatics consulting firm Ballard-King, Bailey said, and things should move quickly after that. "It's going to be pretty aggressive. It's not like (Ballard) is new at this," Bailey told The Review this week. "The agenda for our next meeting is aggressive, and I think we're going to move through this process quicker than we expected. We want to move efficiently, but we also want to make sure we are thorough in our decision-making." Randy Miller, the district's executive director of project management, says it will be the job of the task force to develop a list of requirements for a new pool. "This will inform the subsequent design effort," Miller said. "The task force is also charged with developing an operating business plan to match the program so that the district can keep operating revenues commensurate with expenses." According to Bailey, Musick asked the task force to look at the future pool's programming needs first — to serve not only the district but also the community — and then move toward developing a business model before finally tackling the design of the pool itself. Bailey estimated that the design phase will take about 15-18 months, with an estimated completion date of June 2020. Construction of the new Lakeridge Junior High is scheduled to finish in late summer 2020. If all goes according to plan, pool construction would then begin the following summer, in 2021. However, Bailey said, "When we get to the design phase and the architecture phase, this might change." The district is still hoping to find an alternative source of funding to complete the pool project, Bailey said, because the $7 million allocated in the May 2017 bond measure will likely not cover the costs of a new facility. In the summer of 2017, the Lake Oswego Swim Club commissioned a study by the pool design firm Counsilman-Hunsaker to develop recommendations and estimated costs "in the interest of helping the school district move more quickly toward building a pool." The results were presented to the School Board in September 2017, and published on the Swim Club's website. The study recommended a 50-meter pool that could be divided in half by movable bulkheads, creating a total of 16 lanes, as well as an adjacent three-lane warmup pool. The report also suggested using a stretched fabric roof over the pool to save on construction costs, and recommended that the pool site be a minimum of 3.06 acres. The estimated cost to build that project: $13.3 million. However, the district has not yet decided on the size or requirements of the new pool, Bailey said, so it's impossible to know the actual costs the district will face. The current eight-lane, 25-yard pool is located on the Lake Oswego High School campus and is owned and operated by the district for both athletic and community uses. For Lake Oswego residents, it's the only local pool option outside of private athletic clubs or neighborhood pools owned by homeowners associations. In February, pool advocates asked the Lake Oswego City Council to consider partnering with the district to fund and operate the new pool, but on Feb. 27, the council voted not to help with maintenance or operations. The possbility of a capital contribution to the cost of building the pool remains open, but Bailey said the task force will continue to look for other sources of funding. "We'd love some business partners of some kind going forward," he said. "I'm sure we'll have some conversations with the City going forward, and anyone else who would like to partner with us." Bailey said Ballard-King has scheduled four meetings with the Pool Task Force, and the district would like to have recommendations from the task force in hand by the end of March 2019. The Dec. 17 meeting will be held from 4-6 p.m. in the staff development room of the building across the parking lot from the current pool, which is located on the campus of Lake Oswego High School (2501 Country Club Road). For more information, visit www.losdschools.org/domain/1788.